What are kidney cancer symptoms and signs? How is kidney cancer staging determined? The kidneys are two organs in the body that filter the blood and remove waste material and excess water by making urine that is expelled as waste. 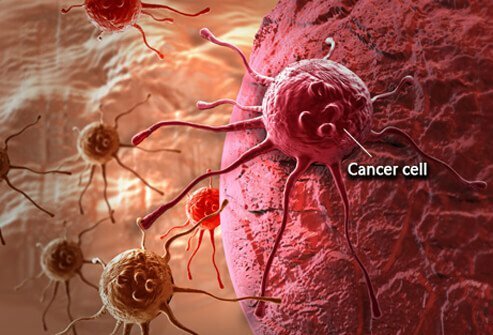 Cancer is the growth of malignant (abnormal) cells within the body. The following tests are used to help diagnose kidney cancer: physical exam, urine tests, CT and/or MRI of kidney tissue, and ultrasound. Surgical removal of kidney tissue allows the type of kidney cancer to be determined. Renal cell cancer (subtypes: clear cell, papillary renal cell, chromophobe renal cell) makes up about 90% of all kidney cancers. Rare types of kidney cancer include carcinoma of the collecting ducts, renal medullary carcinoma, sarcomatoid cancer, transitional cell carcinoma, Wilms tumor in children, oncocytoma, hereditary papillary renal cancer, and unclassified renal cell carcinomas. Kidney cancer is staged by measuring the size of the tumor, the location of the cancer cells either confined to the kidney, locally spread, or widespread beyond the fibrous tissue surrounding the kidney (stages I through IV). There are other similar staging systems. Treatment of kidney cancer includes one of or a combination of the following methods: chemotherapy, radiation therapy, embolization, biological therapy, and surgery. Side effects of kidney cancer treatment are related to the methods used and may include the following: nausea and vomiting, weakness, weight loss, infection, flu-like symptoms, diarrhea, skin rash, and hair loss. After treatment, follow-up care is very important to monitor recovery and to check for any possible recurrence of kidney cancer. Research is ongoing; combined chemotherapy and stem cell transplantation is an active area of research. Other studies include developing cancer vaccines to help the immune system attack cancer cells. There are a number of resources available for patients who have kidney cancer; they are listed at the end of this article. 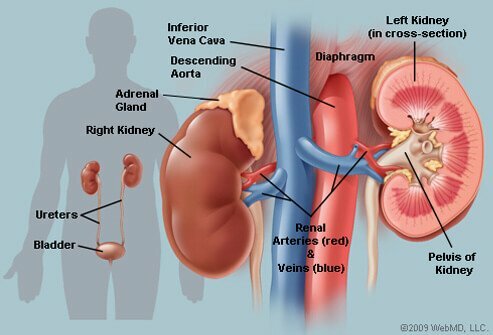 Your kidneys are a pair of organs in your abdomen. Each kidney is about the size of a fist. Your kidneys are part of the urinary tract. They make urine by removing wastes and extra water from your blood. Urine collects in a hollow space (renal pelvis) in the middle of each kidney. 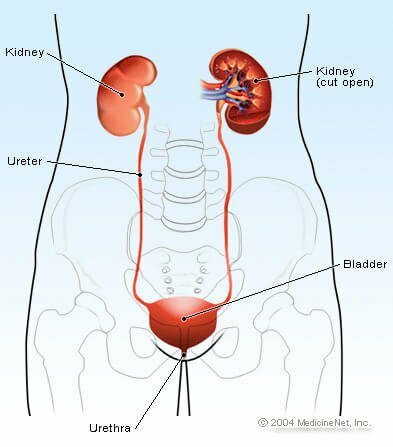 Urine passes from your renal pelvis into your bladder through a long tube called a ureter. Urine leaves your bladder through a shorter tube (the urethra). Your kidneys also make substances to help control blood pressure and to make red blood cells. Attached to the top of each kidney is an adrenal gland. A layer of fatty tissue and an outer layer of fibrous tissue surround the kidney and adrenal gland. Cancer begins in cells, the building blocks that make up tissues. Tissues make up the kidneys and the other organs of the body. Sometimes, this process goes wrong. New cells form when the body doesn't need them, and old or damaged cells don't die as they should. The buildup of extra cells often forms a mass of tissue called a growth or tumor. Kidney cancer cells can spread by breaking away from the kidney tumor. They can travel through lymph vessels to nearby lymph nodes. They can also spread through blood vessels to the lungs, bones, or liver. After spreading, kidney cancer cells may attach to other tissues and grow to form new tumors that may damage those tissues. When you get a diagnosis of kidney cancer, it's natural to wonder what may have caused the disease. Doctors usually can't explain why one person gets kidney cancer and another doesn't. Von Hippel-Lindau (VHL) syndrome: VHL is a rare disease that runs in some families. It's caused by changes in the VHL gene. People with a changed VHL gene have an increased risk of kidney cancer. They may also have cysts or tumors in the eyes, brain, or other parts of the body. Family members of those with VHL can have a test to check for a changed VHL gene. Many people who get kidney cancer have none of these risk factors, and many people who have known risk factors don't develop the disease. If you have symptoms that suggest kidney cancer, your doctor will try to find out what's causing the problems. Blood tests: The lab checks your blood for several substances, such as creatinine. A high level of creatinine may mean the kidneys aren't doing their job. Ultrasound: An ultrasound device uses sound waves that can't be heard by humans. The sound waves make a pattern of echoes as they bounce off organs inside your abdomen. The echoes create a picture of your kidney and nearby tissues. The picture can show a kidney tumor. When cancer spreads from its original place to another part of the body, the new tumor has the same kind of abnormal cells and the same name as the primary (original) tumor. For example, if kidney cancer spreads to a lung, the cancer cells in the lung are actually kidney cancer cells. The disease is metastatic kidney cancer, not lung cancer. It's treated as kidney cancer, not as lung cancer. Doctors sometimes call the new tumor “distant” disease. You may want to see a urologist, a surgeon who specializes in treating problems of the urinary tract. Other specialists who treat kidney cancer include urologic oncologists (surgeons who specialize in cancers of the urinary tract), medical oncologists, and radiation oncologists. Your health care team may also include an oncology nurse and a registered dietitian. At any stage of disease, supportive care is available to control pain and other symptoms, to relieve the side effects of treatment, and to ease emotional concerns. Information about such care is available on NCI's Web site at http://www.cancer.gov/cancertopics/coping. For example, some people with kidney cancer may need to have radiation therapy to relieve pain or certain other problems. Radiation therapy uses highenergy rays to kill cancer cells. You may want to talk with your doctor about taking part in a clinical trial. Clinical trials are research studies testing new treatments. They are an important option for people with all stages of kidney cancer. Can you recommend a doctor who could give me a second opinion about my treatment options? There are two approaches for removing the kidney. The surgeon may remove the tumor by making a large incision into your body (open surgery). Or the surgeon may remove the tumor by making small incisions (laparoscopic surgery). The surgeon sees inside your abdomen with a thin, lighted tube (a laparoscope) placed inside a small incision. Sometimes a robot is used. The surgeon uses handles below a computer display to control the robot's arms. It takes time to heal after surgery, and the time needed to recover is different for each person. It's common to feel weak or tired for a while. If one kidney is removed, the remaining kidney is usually able to do the work of both kidneys. However, if your remaining kidney isn't doing a good job cleaning your blood, you may need dialysis. Some people may need a transplant with a healthy kidney from a donor. People with kidney cancer that has spread may receive biological therapy. Biological therapy for kidney cancer is a treatment that may improve the body's natural defense (the immune system response) against cancer. The treatments used for kidney cancer can slow the growth of tumors or shrink them. The biological therapy is injected intravenously or under the skin. The treatment may be given at the hospital or a doctor's office. Before starting treatment, you may want a second opinion about your diagnosis, stage of cancer, and treatment plan. Some people worry that the doctor will be offended if they ask for a second opinion. Usually the opposite is true. Most doctors welcome a second opinion. And many health insurance companies will pay for a second opinion if you or your doctor requests it. Some companies require a second opinion. If you get a second opinion, the second doctor may agree with your first doctor's diagnosis and treatment plan. Or the second doctor may suggest another approach. Either way, you have more information and perhaps a greater sense of control. You can feel more confident about the decisions you make, knowing that you've looked at all of your options. It may take some time and effort to gather your medical records and see another doctor. In most cases, it's not a problem to take several weeks to get a second opinion. The delay in starting treatment usually will not make treatment less effective. To make sure, you should discuss this delay with your doctor. It's important for you to take very good care of yourself before, during, and after cancer treatment. Taking care of yourself includes eating well so that you get the right amount of calories to maintain a good weight. You also need enough protein to keep up your strength. Eating well may help you feel better and have more energy. Sometimes, especially during or soon after treatment, you may not feel like eating. You may be uncomfortable or tired. You may find that foods don't taste as good as they used to. In addition, the side effects of some treatments (such as poor appetite, nausea, or vomiting) can make it hard to eat well. You'll need regular checkups (such as every 6 months) after treatment for kidney cancer. Checkups help ensure that any changes in your health are noted and treated if needed. Kidney cancer may come back after treatment. Your doctor will check for return of cancer. Checkups may include blood tests, a chest x-ray, CT scans, or an ultrasound. Learning that you have kidney cancer can change your life and the lives of those close to you. These changes can be hard to handle. It's normal for you, your family, and your friends to need help coping with the feelings that a diagnosis of cancer can bring. Support groups also can help. In these groups, patients or their family members meet with other patients or their families to share what they have learned about coping with cancer and the effects of treatment. Groups may offer support in person, over the telephone, or on the Internet. You may want to talk with a member of your health care team about finding a support group. Doctors all over the world are conducting many types of clinical trials (research studies in which people volunteer to take part). Clinical trials are designed to find out whether new treatments are safe and effective. Even if the people in a trial do not benefit directly from a treatment, they may still make an important contribution by helping doctors learn more about kidney cancer and how to control it. Although clinical trials may pose some risks, doctors do all they can to protect their patients. Doctors are studying new targeted therapies and drug combinations for kidney cancer. If you're interested in being part of a clinical trial, talk with your doctor. "Kidney Cancer." National Cancer Institute. August 2010. <http://www.cancer.gov/publications/patient-education/wyntk-kidney.pdf>. What were your symptoms of kidney cancer? What is the prognosis for your kidney cancer? What was the treatment for your kidney cancer? Did you have any risk factors for kidney cancer? How was your kidney cancer diagnosed? What type of follow-up care have you, a friend, or relative received for kidney cancer? Please share your experience with renal cell carcinoma.